Universal Education: How Tourism Can Help? Education is one of the most powerful and proven vehicles for sustainable development. Yet in many places throughout the world, children don't have much chance of completing school. Many school-aged children have never even been to primary school, let alone attended middle or high school or graduated. Between 2010 and 2013, the global number of out-of-school children of primary school age rose by 2.4 million to reach more than 59 million, of which 30 million lived in sub-Saharan Africa and 10 million in South and West Africa; 1 in 5 are estimated to drop out with 2 in 5 never setting foot in a classroom (UN Sustainable Development, 2016). SDG #4 "Quality Education: Ensure inclusive and equitable quality education and promote lifelong opportunities for all". The goal aims for all girls and boys to complete free primary and secondary schooling by 2030, to provide equal access to affordable technical and vocational education and training (TVET), to eliminate gender and wealth disparities, and achieve universal access to a quality higher education and lifelong learning opportunities. Education is actually the issue most commonly addressed by companies’ social responsibility actions to advance the UN goals, demonstrating that the business community views education as a top global development priority, and helping reduce its reliance on global aid. Measuring learning achievement, starting in the early grades, will help to identify where schools are failing to meet their commitments to children and to formulate appropriate remedial action. The tourism industry can be an especially valuable partner and incentive to improve education, located in the same local environments, and offering the potential for jobs, training and investment. One of the founding principles of Lapa Rios in Costa Rica was in supporting education as a long-term empowerment tool to sustain isolated wilderness regions, wanting to eliminate the need for people to leave rural communities for education or professional opportunities. Likewise, after 35 years of school group tourism, it’s no surprise local education is a key priority for Chris & Mike of Kasbah du Toubkal, Morocco. Infrastructure: Limited state funding for education sees minimal government-provided support. Children often have to walk many miles to schools which are vastly over-subscribed and in disrepair, studying all day lacking even the most basic of furniture with uncomfortable and inadequate facilities and equipment. SEED Madagascar work with local government and communities to build new schools, repair existing buildings, provide furniture and facilities, and support teachers. Once construction is complete, each community takes on responsibility for ongoing maintenance of the buildings with SEED's support to ensure the benefits are felt for years. When Lapa Rios Ecolodge was built in 1992, the local people asked for help to build a primary school, requiring raising $45,000 for a pre-fab kit of two classrooms, a dining hall, a lavatory with flush toilets, and a teacher's house. While raising the funds, a taxi-truck was hired to take the children to the primary school in Puerto Jiménez every day, until it was finished in 1993. Support the primary school which you can visit when you stay at Lapa Rios for a fabulous holiday. The Maasai Wilderness Conservation Trust have constructed 8 classrooms, a 2 bedroom head teacher's house, a modern library complete with books and computers, piped water and solar power for Iltilal Primary School’s 1000 children. In Morocco, the Village Association has helped construct a school for 80 children in an outlying valley, for those where distance would otherwise make education inaccessible. Teaching staff: Round the world, there are low numbers of paid teachers, and almost non-existent teacher training. New primary school teachers are needed: nearly 26 million of them by 2030 by current estimates. Africa faces the greatest challenges in this regard, with nearly 7 in 10 countries experiencing acute shortages of trained primary school teachers. In 2013, only 71 per cent of teachers in sub-Saharan Africa and 84 per cent in Northern Africa were trained in accordance with national standards. In Nepal, where education IS social security, guest support has enabled Tiger Mountain Pokhara Lodge to provide the salary of one teacher, teaching materials, the rebuilding of the secondary school block with improved facilities and sponsorship for pupils and staff's children. This has enabled classes to be taught to School Leaving Certificate level, particularly beneficial for female students to complete education within the community, and a volunteer mentor programme for the schools teachers’ own English teaching skills. Literacy: At the end of primary school, children should be able to read and write and to understand and use basic concepts in mathematics. However, in 2014, between 40% and 90% of children failed to achieve even minimum levels of proficiency in reading, in 10 African countries, and in nine of those countries, between 40% and 90% of children failed to achieve minimum levels of proficiency in mathematics. Illiteracy cost the global economy $1.2tn in 2015. Language: Often English education is very limited due to a number of the above reasons and a lack of skilled teachers, negatively impacting students’ chances of learning and progressing on to further education and employment, for which English may be a prerequisite. A lack of English language skills can lead to people and places being effectively cut off from national and international trade routes and development opportunities. Tourism’s importance to national and local economies (usually in the top 3 industries for the Least Developed Countries), makes the English language an extremely valuable skill all over the world, and to international business as a whole as the world’s global language. The use of digital technology, often widely accessible in areas of poverty, is also often conducted in English. (More people now have access to a mobile phone than a toilet – United Nations, 2013). This not only provides an opportunity for developing and synthesising personal and business use vocabulary, but also new platforms to capitalise on to enhance English education provision through media. For supporting English teaching, SEED Madagascar will pilot the production and distribution of English language CDs, SD cards and workbooks in order to provide users with native English audio – currently lacking in school English education – and complementary written exercises and activities. You can help. Inclusiveness: The tourism sector can provide incentives to further invest in education and labour mobility, especially inclusive of youth, women, senior citizens, indigenous peoples & those with special needs, also helping teach values of tolerance, peace, global exchange and citizenship. A well-trained and skilful workforce is crucial for tourism to prosper. Lapa Rios in Costa Rica found their construction of the local primary school and community education wasn’t just about reading and writing, but also conveying new ideals like sustainability and building self-esteem. So they became a school for everyone, helping support a community around the idea of conserving the rainforest, as well as educating guests. Now the Lapa Rios Reserve can only ever be used for educational purposes legally, conserved as it is in perpetuity. Tiger Mountain Pokhara Lodge provides staff an education allowance to subsidise costs of up to two children from kindergarten to School Leaving Certificate age 17. In Morocco, the Kasbah du Toubkal’s costs include contribution to Education for All charity to enables young girls from local villages to pursue further education by providing scholarships and high quality boarding houses, where it would normally be not only cost-prohibitive but also socially unacceptable for girls to be away from family. Now disadvantaged girls 12-18 can complete secondary school and university. Goal 1 End Poverty: Children from the poorest 20 per cent of households are nearly four times more likely to be out of school than those of the richest households. Becoming trapped in a cycle of poverty can result in limited opportunities for employment or income generation. Helping people out of poverty can increase access to education, and increased access to education can help people out of poverty. In Malawi, RSC works in partnership with inspiring community initiatives offering immersive learning opportunities for individuals, students & businesses to gain an insight into and thus supporting key global challenges facing rural communities in Africa. Goal 3 Health & Well Being: Education and training of medical professionals is essential for building effective health systems, in complement to consumer behaviour-change based education programmes to be effective in addressing the risks associated with both infectious and non-communicable diseases. Jicaro Island Ecolodge in Nicaragua supports local community health through the local school. They’ve decorated classrooms, upgraded equipment, and helped make the school usable after dark with solar power for adult education and as a medical centre. Vitally, they have installed a filtration system to provide safe drinking water for the school and 600-strong community, rather than their drinking lake water, and have created “A glass of milk” initiative to fight malnutrition. Goal 5 Gender Equality: Worldwide, in 2013, two thirds of the 757 million adults (aged 15+) who were unable to read and write were women; 1 in 10 girls were out of school, compared to 1 in 12 boys. Accessing education helps women access employment and incomes, helping them achieve greater economic equality. Increased educational attainment accounts for about 50% of economic growth in OECD countries over the past 50 years, over half of which is due to girls experiencing greater access to education. Overall, education empowers women to take a more active role in society. SEED Madagascar’s WASH programme has delivered water, sanitation, and hygiene (WASH) educational lessons to 6,567 primary school children and family knowledge sharing sessions. Goal 8 Decent work and economic growth: Education and skills development equip people for productive and sustained employment and entrepreneurship. Employment and entrepreneurship are, in turn, core drivers of economic growth. Lifelong learning through sustainable development also supports global citizenship, which can help address overarching society requirements such as ‘living together’ and the ‘relationship with nature’. An original mission setting up Chumbe Island Coral Park was free marine conservation education. This began with lobbying the government for support and understanding for the importance of creating a Marine Protected Area; continued with training fishermen away from dynamite fishing into new livelihoods as local guides and powerful guardians and advocates for the natural world; to teaching visitors and local children through Environmental Education programmes and practical lessons how to swim and snorkel. By mid-2015, Chumbe had taught over 6,500 schoolchildren, 1,100 teachers and 700 community members, helped create conservation awareness and support amongst government officials, and involved all staff in learning the basics of reef ecology, forest ecology, English language, ecotourism and eco-technology. Goal 12 Responsible consumption and production: Education plays an important role play in awareness of how to live more sustainable lifestyles, such as reducing unnecessary consumption and waste. Goal 13 Climate Action: Education is needed for awareness-raising and capacity-building to help mitigate and adapt to climate change, and how it inter-relates to initiatives throughout the all the SDGs. 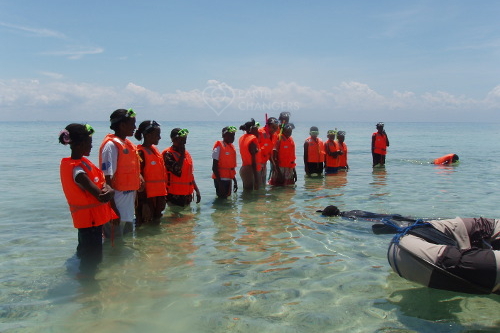 In 2007, Chumbe Island Coral Park expanded its Environmental Education programme with the Chumbe Challenge Environment Award, providing teaching material for student environmental clubs to work on local environmental issues once they have returned from an educational field excursion to Chumbe Island, such as waste management and climate change mitigation projects such as composting, tree and mangrove planting activities. Chumbe has since taken its educational efforts nationwide by creating a coral reef module for local school circula in collaboration with the Ministry of Education, a locally developed guidebook called ”Environmental Sustainability in Zanzibar” and the “Each one - teach one: WASTE in Zanzibar” to encourage observation and enquiry into waste related environmental issues that are meaningful to all of us, wherever we are! Goal 16 – Peace and Justice: Education is a strong driver of social development in post-conflict settings.